Slate Roof Central Message Board: Insulation? vapor barriers? What the #@*&%$@ am I supposed to do? Have you Considered heat cables? This will keep the 'avenues' open regardless. It's a simple, inexpensive solution for preventing ice from building up. I'm still replacing gutters from the 21" of snow during the first of Feburary. And I have installed a few heat cables since then also. I had a customer on Main St Slippery Rock who always had trouble with an 'ice glaciers' forming on the outside of both 4" PVC pipe downspouts. He already had heat tapes on the roof and in those downspouts. I pulled the heat tapes up out of the spouts and foung that there was only 3' worth of the end of the heat cable in there. - water would freeze solid at the base (at sidewalk) of the downspout and up to the near the end of the heat cable and then it would be just a matter of a continueous flow or water seeping from a joint and frezzing on the outside. I rerouted heat tape so it made it down past the sidewalk level ... problem solved. O.K. You all were very helpful concerning my previous question/thread here. Chris Paulin came by last week and did a very nice repair on my slate roof, and we had a extremely informative conversation about what needs to be done in order to avoid having ginormous icicles fall from the edges of my slate roof onto my asphalt lower roof. The problem is that I've managed to get myself confused again. Can you all help straighten me out? As you can see from the photo, the roof is old style slate on top of 1 x 6 boards serving as the deck. The thing is that I've come across a variety of suggestions on this site for how to install insulation. I understood Chris to suggest that I use roll fiberglass on kraft paper, and stick the fiberglass between the rafters on top of styrofoam baffles, while stapling the kraft paper to the rafters to act as a seal. But from the various posts in this forum, I've gotten the impression that unless I do a REALLY good job of sealing the insulation with a vapor barrier, installing insulation against the wood supports for a slate roof is a recipe for disaster, since that will allow moisture to condense on the wood, and slowly rot it out. It's entirely likely I just misunderstood Chris's advice. The thing is, I'm SURE that I won't be able to totally seal off the insulation, given the way the roof rafters dive down into the attic floor. My second problem is that most of the various forms of insulation I've researched call for it to be sealed off from any heat source (like my furnace, for example) by sheetrock or other fire prevention material. And once again, I'm not sure I can install sheet rock up where it would seem to be necessary, given the distinct lack of maneuvering room up there. 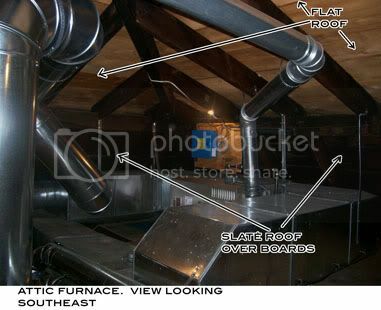 So can I get some advice, about whether and how to insulate the attic, given the tight spaces, the sheetrock recommendation, and the vapor barrier or lack thereof issue?